CECHGxx - Model G - console in all regions except Japan. Sony devised the CECHG 40gb PS3 model to reduce costs and offer the core PS3 console at a lowered retail price. The CECHG also marked the first reduction in the chipset size from a 90nm Cell to a 65nm Cell processor. This change also resulted in reduced power consumption and lower operating temperatures. 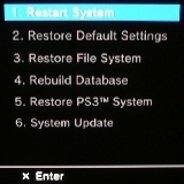 The cost of production was greatly reduced by the removal of all PS2 legacy hardware, both CPU and GPU and memory card slots along with a reduction to using only two USB ports. This made the CECHG the first Playstation 3 console with zero PS2 compatibility. Though many consumers were dismayed at the reduced feature set, the CECHG was a full $200 cheaper than the original 60 gb CECHA at launch, making it the least expensive PS3 console to that date. POWER CONSUPTION - 160 Watts Avg. / 280 Watts Max. USB - Two front-mounted USB 2.0 compatible ports.